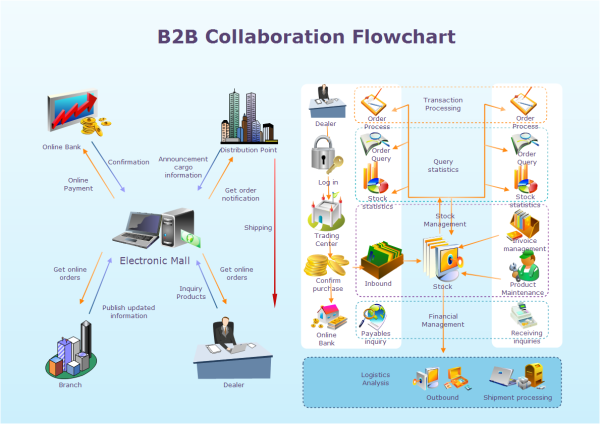 A B2B collaboration flowchart sample drawn with Edraw flowchart software is presented below. Using this easy customizable B2B collaboration template, you can represent any existing B2B flowchart easily. B2B collaboration flowchart template can save a lot of time when creating great B2B collaboration flowchart by using built-in flowchart symbols right next to the design. You can download and modify these B2B collaboration flow charts for your own use. Edraw not only includes basic flowchart symbols, but also contains a large quantity of clip arts which you can use to decorate your flowchart. For example, the business clip arts have made the following flowchart visual and vivid. Discover why Edraw is an awesome flowchart creator. Try Edraw FREE. 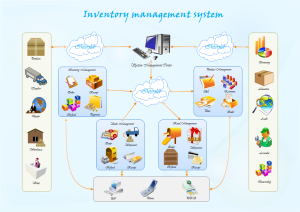 An inventory management system template is meticulously prepared in vector format for your own designs.